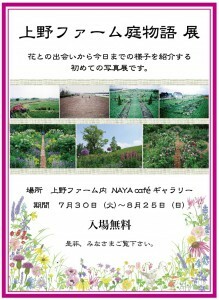 Ueno Farm began planting flowers on the farm in 1989. Around 24 years has passed and changed, now the garden has become a big presence for Ueno Farm. Although we encountered various difficulties, hardships and problems until the present garden was formed, with the power of many who cheered and the power of plants that always give us a healthy and dream always I was able to come over. 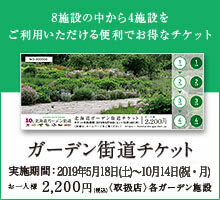 This exhibition selects memorable photos from among over 10,000 recorded pictures taken until today, with the theme of encountering Ueno Farm's flowers, encounters with people, and creating gardens to date I will. Please come and have a look by all means when coming near you.